One study found that raising sheep in New Zealand and importing the lamb to Britain actually generates less carbon dioxide than raising sheep in Britain. What did you eat for breakfast this morning? A banana from the Philippines? Greek yogurt with Chinese honey? Or did you start your day with a cup of Columbian coffee with cane sugar from Brazil, a glass of Florida orange juice, three eggs scrambled with Wisconsin cheddar and an Australian steak? Now ask yourself this: What would you have eaten if you were trying to consume foods that were grown or raised close to home? It’s a question that has been plaguing many environmentalists since they joined the “local food” movement. For these “locavores,” buying local is about getting the freshest food, connecting with local farmers and cutting emissions of carbon and other pollutants by limiting “food miles” — the distance food has to travel to reach the dinner table. The term “food miles” was coined in 1992 by Tim Lang, now a professor of food policy at City University in London. His intention was to invent “a phrase that encapsulated the complexities of distance, energy, culture and trade in some form that ordinary people could use and find meaningful.” Whether Lang succeeded is debatable, but either way the concept has spread like wildfire. Over the past decade, the term has been adopted by both environmentalists and farmers, spawning local food movements all over the United States and Europe. As a result, a growing number of grocery stores tell you not only how much your grapes will cost, but also from whence they came. And some even devote much of their shelf space to regional foods. The idea that the farther your food travels, the more fuel is consumed and the more pollutants are emitted is simple enough to understand. And perhaps simplicity has been the secret to the concept’s success. But some argue that its greatest strength is also its greatest weakness. For one thing, not all modes of transport are created equal. Airplanes use more fuel per mile than trucks, which use more fuel than container ships and trains. And all use more fuel than sailing ships. That’s why vineyard owners in Languedoc, France, announced that they would begin exporting their wine on sailboats. In February, they shipped 60,000 bottles from France to Ireland. The trip can take a week or more, but using the wind to move ships saves fuel and cuts carbon dioxide emissions. The distance, however, is the same, demonstrating that miles traveled is, at best, a poor proxy for environmental impact. In recognition of this fact, Tesco, one of the largest grocery chains in the United Kingdom, began placing blue and white airplane stickers on air-freighted products in 2007 — the idea being that jets are the least fuel-efficient way to travel and therefore products that arrive by plane are likely to have a greater impact on the environment. The labels are of limited value, however, given that they don’t take into account actual carbon emissions or even distance traveled. The company acknowledges that the stickers are only a first step. And transportation isn’t the only source of greenhouse gases in the food system. Growing crops or raising animals generates emissions too. “Unless you’ve actually analyzed both the production and the distribution parts and then added them together, the mileage alone is a rather misleading concept,” says Adrian Williams, an agri-environmental research scientist at Cranfield University in Bedfordshire, United Kingdom. Such analyses are known as “life-cycle assessments,” and the array of factors that can be incorporated is dizzying. Take, for example, beef. Burning fossil fuels to transport cattle or power slaughterhouses generates carbon dioxide, but the cows and their excrement generate even more potent drivers of global warming — methane and nitrous oxide. To quantify the total amount of greenhouse gases generated by the beef industry, researchers must tabulate emissions from growing, storing and transporting the cows’ feed; raising, transporting and slaughtering the cattle; processing, packaging and storing the beef; and transporting the beef to market in refrigerated trucks. “It’s a large undertaking,” Williams says. And, when all these factors are taken into account, local foods don’t always win. “If your local climate and soil aren’t good for producing the crop then it could be better to grow it a long way away and import it,” he says. 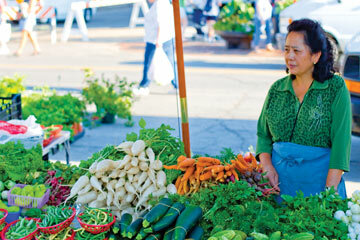 Farmers' markets, such as this one in Des Moines, Iowa, are major sources of local foods. That point was illustrated by Caroline Saunders, a professor of trade and environmental economics at Lincoln University in Christchurch, New Zealand. She and her colleagues conducted a life-cycle assessment for lamb sold in Britain, comparing locally raised lamb with lamb imported from New Zealand. The team only looked at carbon dioxide emissions, not the full gamut of greenhouse gases, yet imported lamb seemed to be the better bet, even when shipping emissions were taken into account. For every metric ton of lamb raised in Britain, Saunders and her colleagues found that nearly 2,900 kilograms of carbon dioxide were produced. For lamb imported from New Zealand, less than 690 kilograms were produced. “We were totally surprised,” Saunders says. 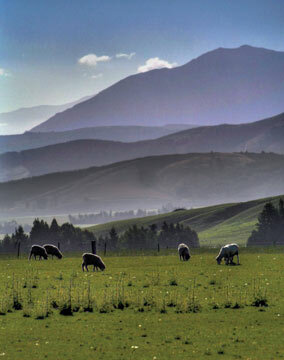 The difference appears to be due in large part to New Zealand’s climate: There, lush grasses grow for longer periods of time, so ranchers rely less on dry feed. But too much information can overwhelm even the most dedicated shopper. “We don’t want to turn our grocery stores into a place that stresses out consumers,” says Richard Pirog, associate director of the Leopold Center for Sustainable Agriculture at Iowa State University in Ames. “If people get over-stimulated they just don’t respond.” Pirog suspects, however, that the lowest-carbon foods are probably easier to spot than people might think. “A balanced, healthy diet without a lot of processed foods that most nutritionists would prescribe is likely to be the choice that’s going to take the least amount of energy to produce,” he says. Williams points out that carbon dioxide isn’t the be-all and end-all of sustainability. Other factors, such as water use, are just as important. For the British, “it may be energetically cheaper to get crops from Spain or Egypt or Israel, but it’s also imposing a big stress on the water resources of those countries,” he says. And so far no one has come up with a way to score foods using multiple indicators of sustainability.